Kyilkhor is the Tibetan word for mandala. A mandala is a manifestation of bodhicitta, the awakened mind. It is a sacred space that represents what we are trying to manifest in our experience and in our world. Everything within the mandala is connected. The mandala acts as a support for the practitioner on the path, aiding them in their contemplation and meditation. It is a pure realm, a field of experience in which the practitioner who aspires to awakening chooses to base herself and her practice. It is all-encompassing, encompassing the heavenly abodes where the Buddhas teach the Dharma, along with the charnel grounds where the practice is carried out to its fruition. A mandala offering is a symbolic offering of the entire universe and our own body, speech and mind to the Teacher and the field of merit. It is a choice, a commitment to support the Teacher and his activity. 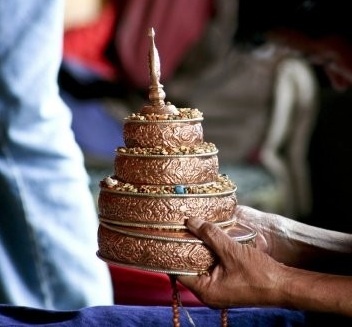 Making offerings to the Teacher increases merit, deepens your practice, and honors the sacred connection you share with the Three Jewels. Such generosity is an acknowledgement of the deep samaya that exists within the mandala and the privilege of having this practice, receiving these teachings and being a part of this community. Make a one-time donation or monthly donations. All donations are tax-deductible and include a year-end summary. 100% of all donations go to supporting Rinpoche and his Dharma activity. For those of you who have been dedicated to supporting Kyilkhor, thank you. Rinpoche values your connection, your generosity and your commitment.